Jasper Hill Farm is the ever expansive dairy project built in 2002 by brothers Mateo and Andy Kehler. Using rotating pastures, a top notch milking program and a series of aging tunnels built into the farm’s hillside, the brothers create a distinct flavor profile adored by many. Their small herd of 45 Ayrshire cows produce milk that is unusually high in fat and protein, perfect for the excellent cheeses made on the farm. 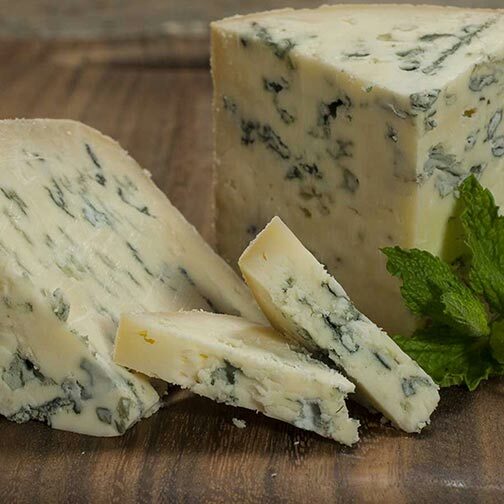 Bayley Hazen Blue is their natural-rinded blue cheese named after the iconic half built Military Road intended as a route to invade Canada during the Revolutionary War. Like most blues, Penicilium roqueforti is used to create its bloomy forest green mold, but the usual peppery spice character associated with blue cheese takes a backseat to the sweet and buttery flavors of the milk. The breakdown of fats and proteins over the 4-5 month ripening period gives this mellow dreamy blue rich nutty and tangy flavors.